I can’t take credit for it perosnally but I am darn proud of my spin on this backyard delicacy. Honestly, I was just looking for something different to experiment with between burger flips and putting dogs in buns. To my surprise, I can’t make enough of them! 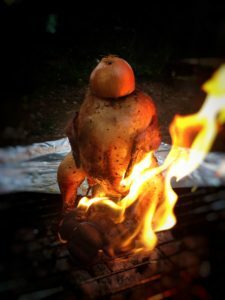 Thank y’all for going bananas over my beer can chicken. I promise, I’ll try to always have a couple everyday but .. when they’re gone, they’re gone. There’s always something cooking @ Hunter’s Beach Bar! Next Post:3 Months @ This Thang! @#?